While Medicare covers inpatient hospital care and medically necessary services provided by physicians in their offices, it requires the patient to pay a deductible and coinsurance amounts for each of these types of care. These deductibles and coinsurance amounts are what Medigap insurance covers. Medigap—also known as Medicare supplement insurance—is privately owned, commercially available insurance coverage that is designed to pay for some of the costs of services that Medicare covers but does not pay. ​Medigap insurance does not cover services that Medicare itself does not cover—it only covers the coinsurance payment that applies to skilled nursing facility care for days 21 through 100 of a Medicare-covered skilled nursing facility stay. Because Medicare does not cover skilled nursing facility care after day 100 of a skilled nursing facility stay, a Medigap policy does not cover it either. Too, Medicare generally does not cover personal care or custodial care; it covers these forms of care only if they are provided in conjunction with the provision of Medicare-covered skilled nursing facility care or home health care. By law, insurers are only allowed to sell ten standardized plans, which are identified by letters: Plans A, B, C, D, F, G, K, L, M, and N. Because Medicare supplement policies can only be sold as standardized plans, the benefits each standard plan provides are the same among all insurers (though the costs of the policies may vary greatly). Thus, all policies for a particular plan (e.g., Plan F policies), no matter which company sells them, will provide the same benefits. All ten Medicare supplement insurance policies must provide the core benefits contained in Plan A, which is the most basic plan. Each of the remaining plans (which progressively become more comprehensive) includes these core benefits but adds varying combinations of other benefits. All Medicare supplement policies must contain these core benefits at a minimum. Insurers are also required to offer the basic core Plan A as a separate policy. 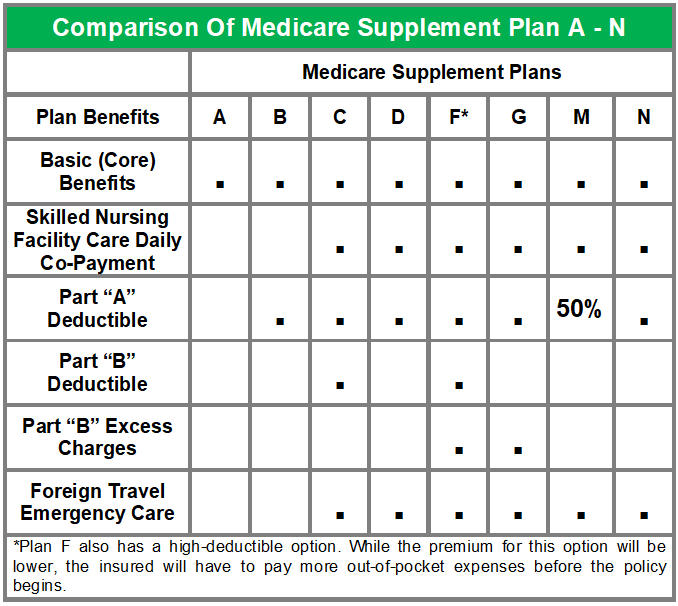 The following table summarizes the benefits provided by each of the standard Medicare supplement plans. Note that newly issued Medicare supplement plans do not cover prescription drugs due to the introduction of Medicare Part D.
Plans K and L are relatively new Medicare supplement policies. These plans contain basic benefits that include similar services as Plans A through J, but the cost-sharing for the basic benefits is set at different levels. They also contain out-of-pocket limits, which are indexed each year for inflation. 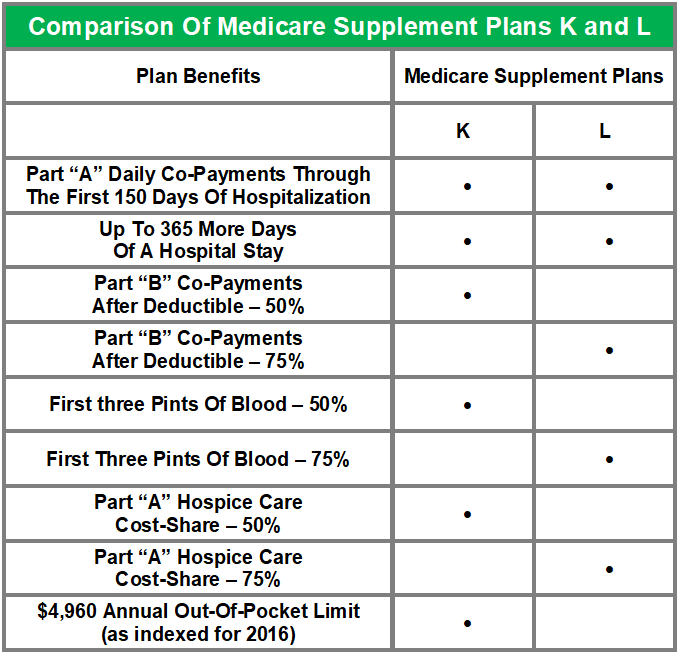 Below are the benefits provided by Plans K and L.